Thanks to everyone who participated in this anniversary event! The support for Grow Your Own continues to grow (pun intended), and I truly appreciate all the good wishes that you have sent for the success of the event. For the first anniversary, we had 23 participants from 7 countries, and we cooked with our homegrown peppers, zucchini, chives, eggplant, mushrooms (wild), sage, chard, chicken eggs, yellow beans, basil, Alternanthera sessilis, yuca, blackberries, lemongrass, Thai peppers, garlic scapes, rosemary, San Marzano tomatoes, parsley, malunggay, sitaw, and bananas. If you are new to Grow Your Own, visit the Grow Your Own page to learn more about the event. Deadlines for entries are the 15th and 30th of every month and we post a round-up a few days later. Because it’s always growing season somewhere in the world, we operate year round. Right now the Northern Hemisphere is getting into harvest season, and the Southern Hemisphere is gearing up for spring planting. And remember, you can always grow indoors, too! Wiffy of Noob Cook is hosting this next round, so be sure to visit to get the details. And now for the round-up! Click the images to visit the posts. 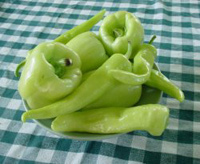 Rachel of The Crispy Cook (New York, United States) used some of her homegrown peppers and fried them up just the way her Italian grandfather used to. Kalyn of Kalyn’s Kitchen (Utah, United States) mixed up a lovely frittata using zucchini, green pepper, and chives from her garden. Ivy of Kopiaste (Greece) received some huge, beautiful eggplants from her sister-in-law’s home garden and made a spicy baked eggplant that she served with grilled chicken. 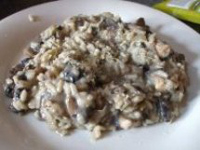 Sam of Antics of a Cycling Cook (Leistershire, England) found a huge wild mushroom while on a ride and used it for a mushroom risotto. 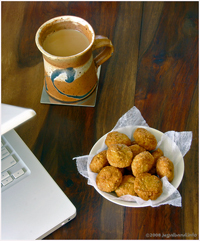 Bee and Jai of Jugalbandi (Northwest United States) used some homegrown sage and a very convenient pan to make cocktail lentil fritters with sage. 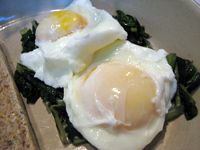 Lauren of I’ll Eat You (Pennsylvania, United States) had a great breakfast of Eggs in a Nest, with farm fresh poached eggs on homegrown sauteed chard. Apu of Annarasa (United States) gathered some yellow wax beans and basil from her garden and made an easy and tasty pasta dish. Lakshmi of Taste of Mysore (Singapore) grows her own greens and herbs on her balcony garden, including Alternanthera Sessilis. The leaves are used as vegetables, and she made a dish of lentils and greens with it. Cris of From Our Home to Yours (Brazil) acquired some yuca from the family farm and made a traditional stew which she spiced with harissa. Jessica of Finny Knits (California, United States) tackled a beast of a blackberry hedge at her mom’s house and won. Her prize? 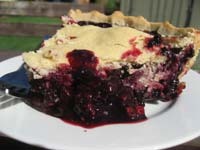 A tasty homemade blackberry pie. 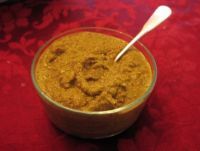 Cheryl of Gluten Free Goodness (Virginia, United States) has an edible garden in her yard, and she used some of her homegrown lemongrass, Thai peppers, garlic scapes, and mild peppers to make a Thai-style red curry paste. 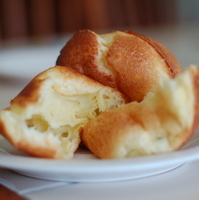 Kim of The Daily WD (United States), the Woman’s Day magazine blog, borrowed some fresh eggs with the feathers still on them and some fresh off the hedge rosemary to make these pretty and savory popovers. Graziana of Erbe in Cucina (Italy) has a Peruvian collnew pepper plant that ripens to a beautiful orange. 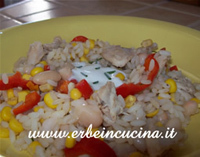 She used the peppers in a hot rice salad along with some sweet peppers, corn, chicken, and beans. Nazarina of The Giddy Gastronome (Colorado, United States) used her homegrown basil, peppers, and tomatoes in a won ton lasagna. 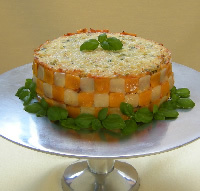 She baked it in springform pan then decorated the sides with small squares of mozzarella and sweet milk cheese. Victoria of Feed Yourself (Washington, United States) has plenty of chard this year, and she used some to make these easy Swiss chard cakes. 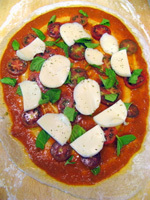 Nathan and Annie of House of Annie (California, United States) used their homegrown tomatoes and basil to make my favorite kind of pizza, a pizza margherita. 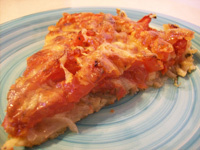 Reeni of Cinnamon Spice and Everything Nice (New York, United States) made a beautiful caramelized onion and tomato tart with her homegrown tomatoes. And it’s gluten free, too! Kim of Crafty Kim (Tennessee, United States) has tomatoes growing like weeds in her yard. She shows how to roast them with onions and garlic and make a pureed tomato base that’s useful for pasta sauce, pizza sauce, and salsa. Susan of Farmgirl Fare (Missouri, United States) helped out a friend in a pinch and made some tasty lamb burgers using their own grass-fed lamb with her homemade rosemary focaccia. 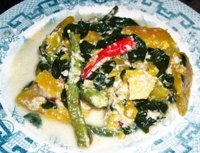 Maria of A Scientist in the Kitchen (Philippines) has a prolific garden, and she used her homegrown malunggay, sitaw (aka long beans), lemongrass, and Thai chilis to make ginataang gulay, also known as vegetables in coconut milk. Ning of Heart and Hearth (Philippines) received a gift of homegrown bananas and made them into an easy and tasty banana crumble. 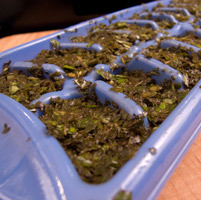 And for my contribution, I (Andrea’s Recipes) posted instructions for how to prepare fresh basil to freeze into ice cube shapes. These are all awesome dishes fresh from the garden. Can’t wait to check them all out. So many delicious looking dishes from the foods people are growing themselves. I’m glad I finally got to participate. Nice roundup. congratulations on GYPO’s first anniversary, and thank you. Congrats on the first anniversary. These are all beautiful and delicious looking! Congratulations on one year of GYO and here’s to many more. Everyone’s photos look so good in this roundup and the food beckons….. Happy Birthday, GYO! Thanks for letting me be a part of the celebration. May you have many more splendid birthdays!